It's been a while since I have made muffins, hasn't it? I used to make muffins all. the. time (ex. here, here, and here). It took a special occasion to get me back to muffin making. One of my coworkers and friends had a birthday last week. Her and I did the Whole 30 challenge together the first time, and started our second round together on Monday. Since she was about to give up all the wonderful food groups, like gluten, chocolate, and sugar, I wanted to make her something that packed all of them into one convenient package! Thus was born the peanut butter chocolate chip muffin! While this recipe is very similar to my basic muffin batter recipe, I did add in one critical ingredient: peanut butter powder. My original plan was to mix in classic peanut butter, but when I was perusing the grocery store aisle I came across this powder. I figured that this would actually be so much easier to incorporate into the muffin batter and wouldn't add as much fat. But, since it is peanut butter chocolate chip muffin, I did add in a swirl of peanut butter which add just the right amount of peanut butter creaminess throughout the muffin. And for an extra punch of peanut butter goodness (because who can get enough peanut butter? ), I mixed together a strussel topping using some of the pb powder. I think it was the topping that made the muffin. I mean, the top of the muffin is the best part anyways; it's crunchy on top and flaky on the bottom. 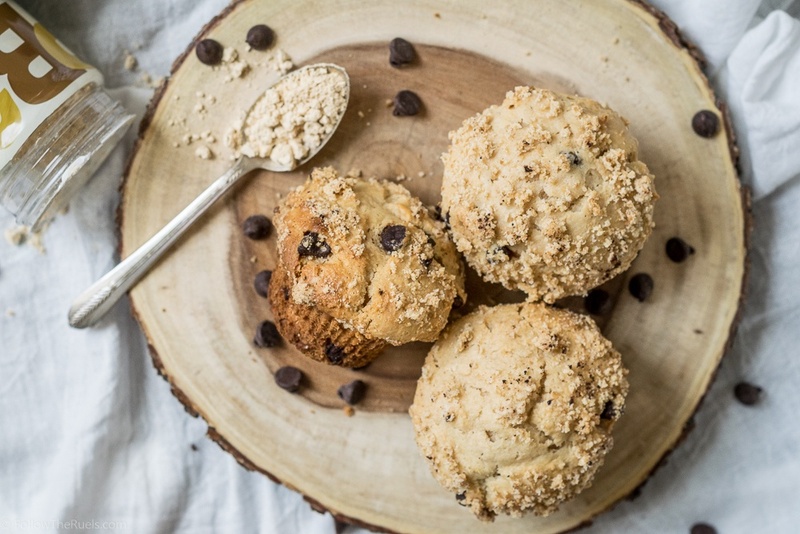 But this just put it over the edge and gave it even more peanut flavor to balance the semi-sweet chocolate chips peppered throughout the muffin. So really, when you think about it, this muffin is pretty much a cupcake without the frosting. But what is wrong with cake for breakfast? Especially on your birthday! Nothing. Nothing is wrong with that. Preheat oven to 350 degrees and prepare 1 regular muffin tin. In a large bowl, mix together flour, peanut butter powder, sugar, salt, and baking powder. In a small bowl or large liquid measuring cup, whisk together milk, yogurt, egg, and vanilla. Pour the liquid ingredients into the dry ingredients, and mix until dry ingredients are just incorporated. Slowly drizzle in butter while your mixing. Fold in the chocolate chips and peanut butter so that there is a ribbon of peanut butter throughout the batter. Scoop 1/4-1/2 cup of batter into each tin using a spoon or, preferably, an ice cream scoop. Mix together topping ingredients until they form a crumbly mixture. Use your fingers to break up butter pieces. Generously top muffins with topping. Bake for 20 to 25 minutes, or until a knife comes out clean.